Here’s what happens when you shake up a classic coating mix with cilantro, parsley, garlic and lime: a simply delicious dish. Otherwise known as our Baked Chimichurri Chicken with Broccoli. Cover baking sheet with foil; spray with cooking spray. Combine coating mix, herbs, garlic and lime zest in pie plate. Mix dressing and lime juice in separate pie plate. 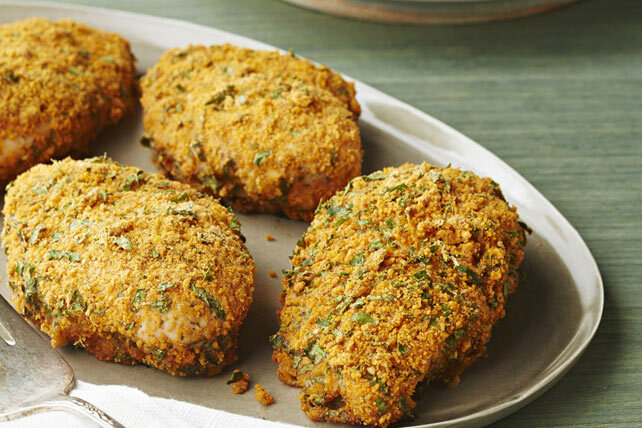 Dip chicken in dressing mixture, then in coating mixture, turning to evenly coat both sides of each breast. Place on prepared baking sheet. Bake 25 min. or until chicken is done (165ºF). About 5 min. before chicken is done, add broccoli to saucepan of boiling water; cook 4 min. or until crisp-tender. Drain broccoli. Serve with chicken.